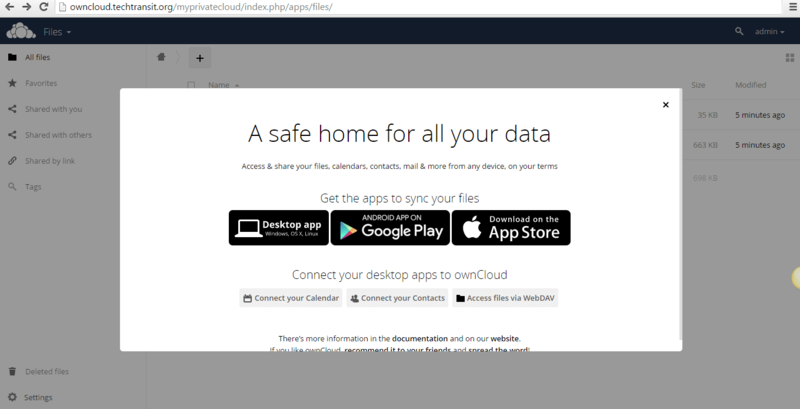 ownCloud is opensource private cloud storage software package that works as straightforward way to serve and store content from its centralized location, Dropbox, iCloud is very similar application which provide this functionality but these are not trustable and users want to secure the data or fetch the data from off the cloud. Now Run your own private cloud storage server and manage the data with sharing with anybody , syncing with mobile and desktop device , documents and notifications etc…. ownCloud is open source based free tool that have not any limitations and make changes as you wish. Data can be share with anybody , who is in your know very well. Flexible secondary storage to provide data to store. You can read PDF’s , see videos with live or real time text editor . Set limits through quota management on external storage. ownCloud maintains files previous versions, so that we can recover from any accidental delete. Task can be synchronized with calendar . 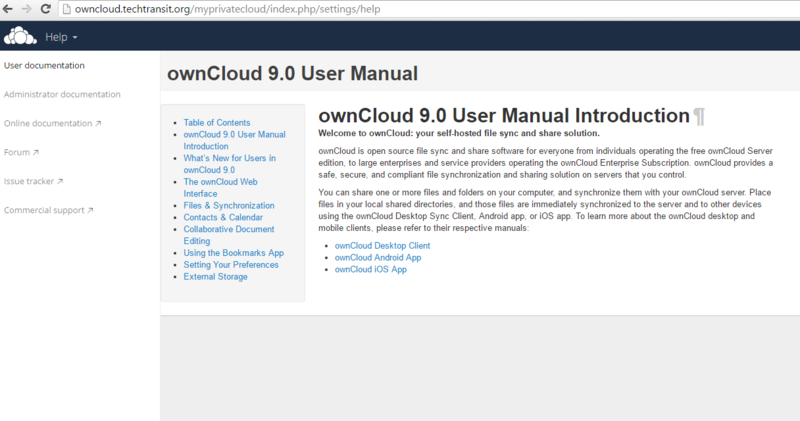 Why Upgrade from Version 8 to ownCloud 9 ? In latest version, new feature is more Reliability like checksum feature , method of data protection and code integrity checking. When number of users make concurrent changes and access simultaneously in same data then file locking produces error or loss of data , now in latest owncloud 9 depreciate the issue. Newer releases have supported for more users. Client will take benefits only in newer version server. You can use RAM according to your requirement or server resources usage or users activity. ⇒ Server OS : Best recommended OS is RHEL 7 ( Red Hat Enterprise Linux 7) or use Linux latest OS, Ubuntu 12.04 , 14.04, 14,10 LTS version. We need to set up first Software Collections ( SCL ) Repository on our CentOS 7 and SCL for RHEL which is compiliance with RHEL server contract. ( Do not use any other third party repository ) Server through below command. Begin by installaing the httpd packages. ownCloud works on PHP 5.4 but this is version of php has been end of life but Red Hat support php 5.4 on lates version 7 . better is use of 5.5 for better performance and security. Now install PHP and its module . also php mysql module . Install MariaDB on server server with yum command. Mariadb group install mariadb-server, mariadb-bench, mariadb-test. Verify of the status of service. Configure the MariaDB Server to improve security. Run below command and read carefully and follow its instructions. Currently software is available on zip and bzip2 compressed file and also download its checksum files to Verify the MD5 or SHA256 . Here we are going to download through bzip2 compression file relatives checksums and check and download through below steps. 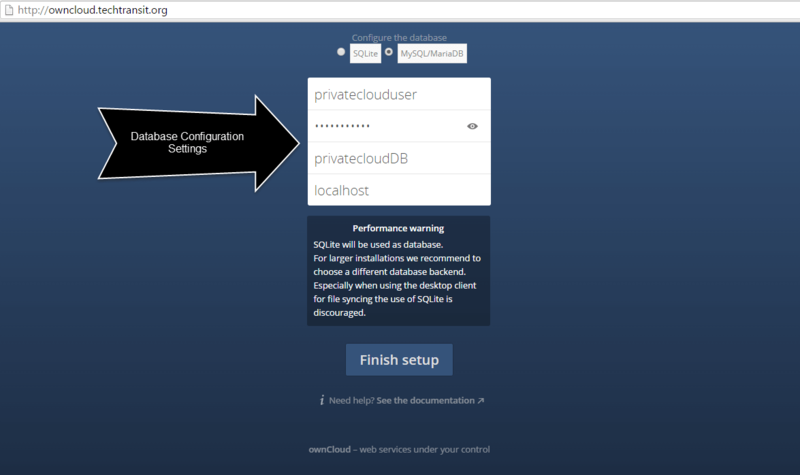 Download ownCloud 9.x bz2 file. Unpack the downloaded bzip2 compress file through tar command. After restarting Apache you need to start installation through graphical method through given fqdn. Now below showing images for installation steps in browser, in first images , here i am giving admin portal username password. which will create for admin login and directory location where data will be stored. you need to set proper permission on that location and in second image you need to set database username database password and database name , which we have created in configuration time. Thank you 🙂 Hope you have enjoy the installation instruction. When will you realize -never- trust MD5 ? Both are trust able algorithm . Concerning the file /etc/httpd/conf.d/owncloud.conf . Do I need to indicate ServerName as “owncloud.techtransit.org” or can I indicate a HOSTNAME as such you would get from a DynDNS account? I’m a bit confused concerning this part of your instructions. I’m trying to set this up as a home server with outside Internet access. Yes ,you can put your host name or domain name , which is pointed to this server, either you can use IP of the system.